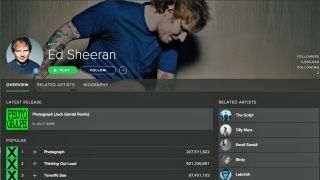 Not content with his many number one songs, Ed Sheeran has also snagged himself another, rather more unique accolade: his track 'Thinking Out Loud' has become the first song ever to hit 500m streams on Spotify. According to the streaming giant, 19m people listen to him on the platform each month, and overall, his discography accounts for approximately 2.9 BILLION streams. He is also on 38m playlists, including such gems as: Just Cry, Sad Songs; Songs That Make Me Cry; and Cry Baby (Depressing Music That Makes Me Feel Better). We are sensing a pattern here. Sadly, Spotify hasn't published any details of how far behind other artists are (you have to wonder how close Taylor Swift got before she pulled her music from the service earlier this year), but the company has released a map which it calls the "Sheerio" index, displaying the relative popularity of Sheeran in different countries around the world. Speaking of the milestone, Sheeran apparently said: "Chuffed to hear that Thinking Out Loud has had half a billion plays on Spotify. Being the first artist to hit that milestone is amazing. Thanks to all the people who use this as a wedding song, soundtrack to a date and as a way to woo someone into a Netflix and Chill situation." Unsurprisingly, there's still no word on how much cash 500 million streams actually brought in.